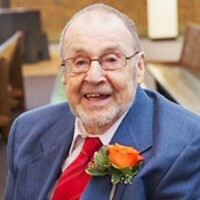 Kaisler, Edward G. age 87, of Savage, formerly of Edina, passed away February 5, 2019. Born in Racine, WI on November 7, 1931 to John and Agnes (nee Polansky) Kaisler. Married Doris (nee Granger) on May 28, 1955 in Racine. Ed and Doris raised six children together, all of whom he was very proud. Preceded in death by his wife of 45 years, Doris, and daughter, Mary Scherbring. Survived by five children: Laura (Craig) Mollet, Julie (Chris) Londgren, Kathy (Mike) Shepherd, Tom (Sheri) Kaisler and Mandy (Mike Shockman) Kaisler; son-in-law, Wayne Scherbring; 10 grandchildren: Megan, Bridget (Charlie), Justin (Caroline), Ben, Maddie, Gabe, Becky (Mike), Kyle (Emily), Jacob and Rachel; two expected great-grandchildren and siblings, Delmar (Ruby) Kaisler and Nancy (Bill) Mutchler. Ed was grateful to God for a long and wonderful life and will be missed by his extended family and friends. Mass of Christian Burial at 10:30 a.m. Monday, February 11, 2019 at Our Lady of Grace Catholic Church, 5071 Eden Avenue, Edina. Visitation one hour prior to Mass at the church. Ed will be interred alongside his wife, Doris at Lakewood Cemetery, Minneapolis.